Monsanto has gained much of its international notoriety - or infamy, depending on whom you talk to - through its Roundup Ready line of crops that are genetically modified (GM) to be immune to the herbicide. To use the herbicide to combat weeds, farmers must buy patented Monsanto GM seeds with the genetic herbicide tolerant trait. 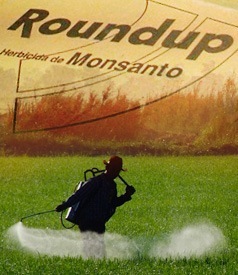 Roundup herbicide is then sprayed to kill unwanted weeds, but the patented GM crops are spared. "And it is the system - the invariable use of glyphosate made possible and fostered by glyphosate-resistant seeds, for instance - that is responsible for the growing epidemic of glyphosate-resistant (GR) weeds," Freese said in his testimony. "This is clearly demonstrated by the near complete absence of GR weeds for the first 20 plus years of glyphosate's use and the explosion of weed resistance in the decade since the widespread adoption of Roundup Ready crop systems." Listed below are links to blogs that reference this entry: War Over Monsanto Gets Ugly. the only way to chock MONSANTO to death is spread around the world the ugly truth about AMERICAN CORN products, AMERICAN SOY products, AMERICAN CANOLA products. Then if world's people want to stay healthy, they will stop buying EVERY SINGLE "food" product that has a name "corn" or "canola" or "soy" in it. It only relates to AMERICAN products. All other "food" products from all other countries should have normal corn and normal soy and normal canola oil. Nevertheless, all corn, canola and soy are not really healthy for you. They should be avoided at all costs, regardless GMO or not GMO. That's how MONSANTO and their franchisees will go to hell. There should be no reason that world's people TODAY at the age of INTERNET won't know the truth about REAL FOOD. REAL FOOD = NOT Processed food:real organic vegetables & fruits, real organic grains and seeds, brown rice etc. This is how humans should keep their health. ALL(with a few exceptions) processed food, in jars and boxes...is a POISON to your body. Period. This ugliness is reminiscent of the cold war and has reappeared in the form of KIA(Knowledge Initiative in Agriculture- read Knowledge Imperfect Always)imposing risky GMOs. The IAEA and the WHO entered into a 1959 agreement to hide the truth about nuclear radiation's effects and is perhaps still in force(Res WHA 12-40,28-5-59). See the ignominy which Andrei Sakharov(and his relations),Mancuso,Gofman,Stewart and others had to go through in the last century. Even today nuclear safety regulations are based on pre dna witchcraft!So is GMO regulation based on the outmoded dogma of molecular biology!GMOs are not food! Because it is based on imperfect knowledge-to see the separate existences apart and seeing them so, to assert thats the truth! Whereas there is perfect knowledge:To see one changeless life in all the lives, in the separate the one inseparable.So really nature puts a limit to the direction in which life evolves. So tearing a gene apart from one seemingly separate life form and introducing it forcibly into another, breaks this rigid interconnection which assures health here and now! Since the effects of interconnection in resulting in evolved health are unknowable because of the myriad interconnections and we have to eat the successful foods to live in health here and now, we must design around our ignorance by practicing the principle of return. Hence GMOs are not food. They are by the application of the precautionary principle something which we must avoid. Hence the normal way of life is the only way. See the URL http://justiceinorout.blogspot.com/ and the references cited therein. This page contains a single entry by Toni published on November 26, 2010 9:00 AM. UK to boost vaccination rates by pumping babies with six vaccines at once was the previous entry in this blog. Vitamin D is Needed to Fight and Prevent the Flu is the next entry in this blog.